Nothing surprises me about parrots. They are the most uncanny, confounded creatures that ever brought endless joy, humor, and destruction to a home. Very smart, very demanding, and very active, you need to keep them very busy, or they find a way to keep themselves busy... You want to avoid the latter. But on to positive things... Constance Woodman and fellow researchers from the BERG lab at Binghamton University in New York were studying animal communication networks, and they designed a scheme to rig up interactive computer games for parrots, who would be rewarded for their brilliance at play by a robot with treats. The only thing they needed was a means of creating prototypes in an affordable way. They sent their idea to Ponoko, an online prototype shop where you upload your ideas and professionals send them back to you in 2D or 3D form within a few days. Ponoko, which was holding a competition for a 2 year free subscription to its services, awarded the BERG lab the prize, and they proceeded to prototype their project quite successfully. It is a very clever design, indeed. As parrots can figure out a way to destroy a computer by tapping at it or just ripping it apart, Ms. Woodman created interactive games that don't respond to parrot 'pecks,' but to parrot squawks. 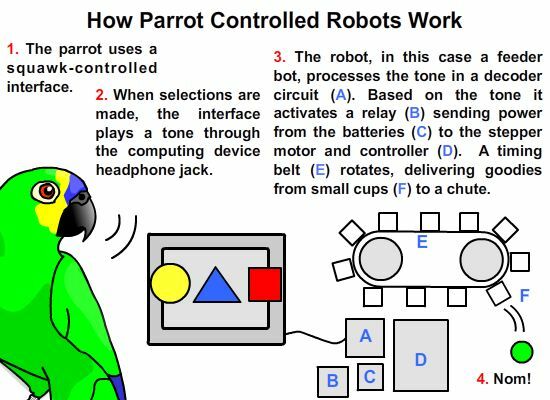 In the games, the parrot squawks and the screen responds, both visually and audibly, so the parrot gets feedback from the computer sound, and then gets a food reward... from a robot. From my own experience reviewing pet toys, I judged the Babble Ball, though a simple talking ball, as the best interactive toy for birds (and dogs and cats, who love them too), but computer gaming for talking birds... this brings 'interactive' to a whole new level. There is an aspect of the gaming that makes me a little nervous. Parrots and members of the parrot family can easily get addicted to toys and games and, as with humans, computer gaming can become one of those addictions. 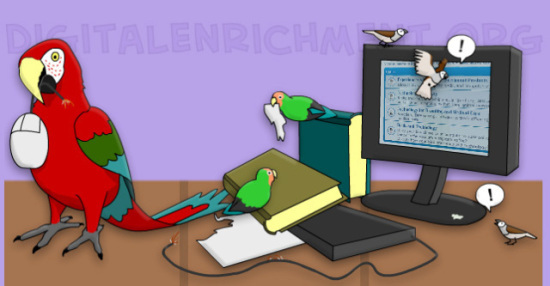 Should these computer games for parrots find themselves in your bird room some day, use caution and limit your bird's exposure. Parrot addictions can cause hyperactivity, stress, and even alienate your bird from his loving owners. Check out the games for yourself at Digital Enrichment. See if you are clever enough to play them. Ponoko, Digital Enrichment, with a tip from a nice reader. That's the buzz for today! I'm looking forward to the Parrot World Computer Gaming Championships! Retire The 'GOP Elephant' If Trump Becomes President?